Hello We R friends! This is your blog hostess, Aly Dosdall. Gift cards are a great way to express thanks for the special teachers in your life. And a pocket card is the perfect place to store them! 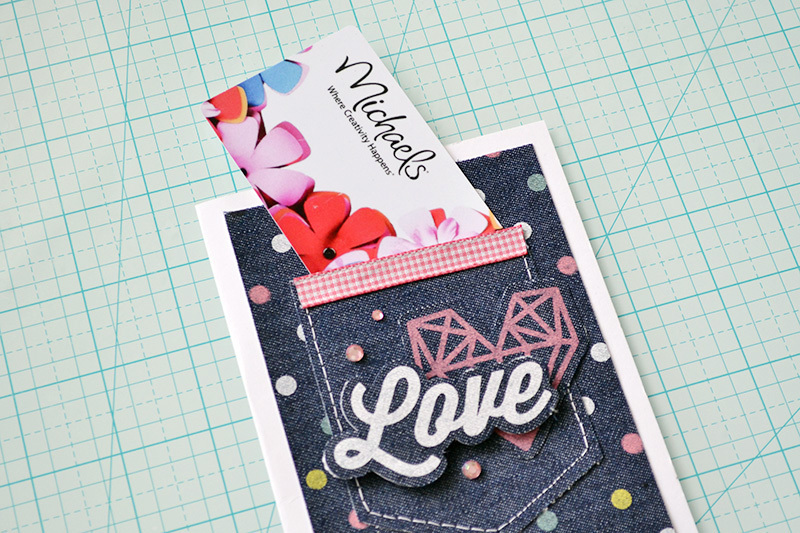 Of course the first thing that came to mind when I decided to create a pocket card was the unique new Denim Blues collection. It is so fun to work with this collection! It’s actual printed denim fabric backed with text weight white paper, so it cuts beautifully with blade trimmers, like our Trim and Score Board and our Banner Punch Board. I used a plain white cardstock base for my card, and then trimmed a layer from the multicolor dot fabric paper. 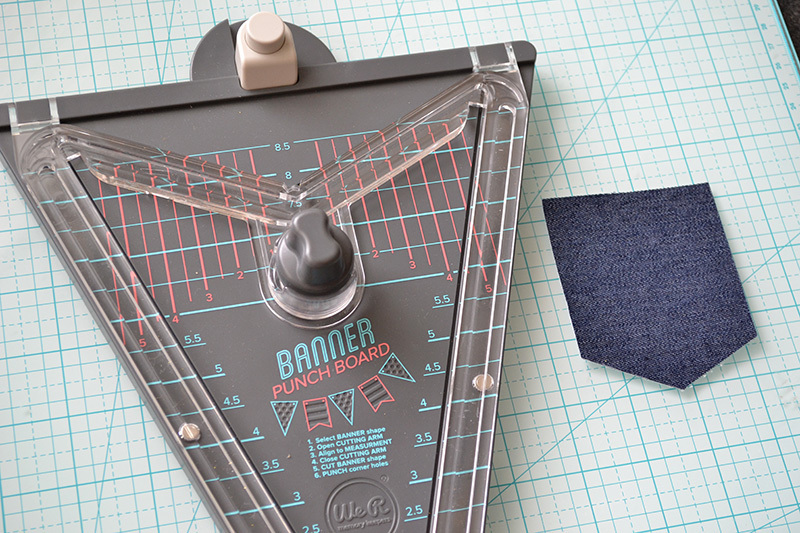 Then I cut a 3 1/2″ x 2 3/4″ piece of solid denim fabric paper and used my Banner Punch Board to cut it into a crest banner shape, which looks exactly like…a pocket! How perfect. I machine stitched my pocket shape to the polka dot layer I had already cut, and then added that to my card base. Then I added some coordinating self-adhesive denim stickers, popping one of them up on foam squares for a little dimension. 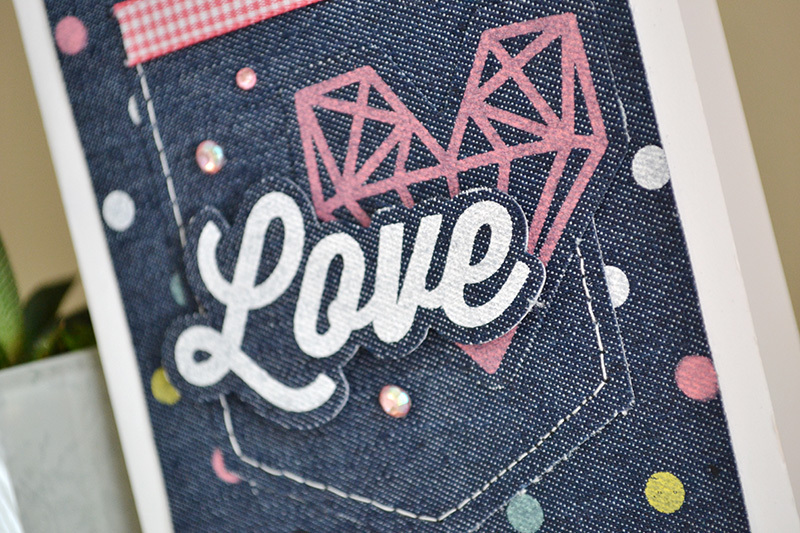 I finished off my card with some gingham ribbon at the top of the pocket, and a few gems for a little glam. My gift card fits inside the pocket perfectly, and I’m pretty sure my daughter’s teacher won’t get any gift packaged quite like this. 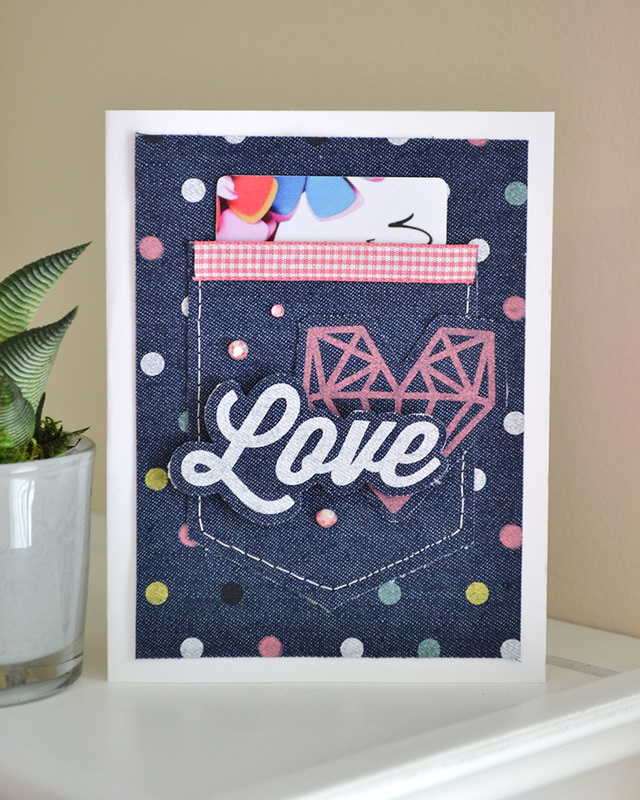 Super cute card, love this denim line, will be keeping my eye out for it. I absolutely love this product line of denim! I saw various denim items in my local craft store a couple months ago and went crazy! I never thought about the Gift Card holder though. Oh the ideas are swimming in my brain!